*NOTE: These changes will not be implemented until the 4th quarter of the year. This is a PREVIEW of the changes to come. Crude Petroleum and Natural Gas Extraction (2012 NAICS Code 211111) will be broken into two new codes in 2017. These codes will be 211120, Crude Petroleum Extraction and 211130, Natural Gas Extraction. Also, Natural Gas Liquid Extraction, (2012 NAICS Code 211112) will become NAICS Code 211130 in 2017. The 2012 NAICS Code for Lead Ore and Zinc Ore Mining (2012 NAICS Code 212231) is expanding to cover Nickel Ore and Lead Ore Mining (2012 NAICS Code 212234) in one inclusive 2017 NAICS Code: 212230. The NAICS Codes for Pump and Pumping Equipment Manufacturing (2012 NAICS Code 333911) and the Code for Measuring and Dispensing Pump Manufacturing (2012 NAICS Code 333913) will be combined in 2017 to become NAICS Code 333914, “Measuring, Dispensing and Other Pumping Equipment Manufacturing”. The 2012 NAICS Codes 335221, 335222, 335224 and 335228 for Household Cooking Appliance, Household Refrigerator and Home Freezer, Household Laundry Equipment and Other Major Household Appliance Manufacturing are all being combined in 2017 to the single NAICS Code: 335220, “Major Household Appliance Manufacturing”. 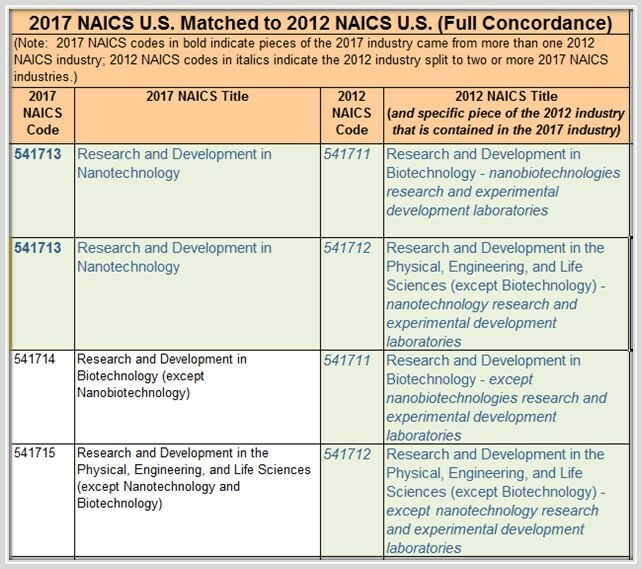 The 2012 NAICS Code 452112 is being split into two NAICS Code Classifications. The first category under 452112, Discount Department Stores (insignificant perishable grocery sales) is becoming part of NAICS code 452210, “Department Stores”, along with 2012 NAICS Code 452111 for Department Stores (except Discount Department Stores). The Second Category under 452112, (for significant perishable grocery sales) is becoming NAICS Code 452311 “Warehouse Clubs and Supercenters”, along with 2012 NAICS Code for that same category, NAICS Code 452910. 2012 NAICS Codes 454111, 454112 and 454113 for Electronic Shopping, Electronic Auctions and Mail-Order Houses are to be classified under 2017 NAICS Code 454110. 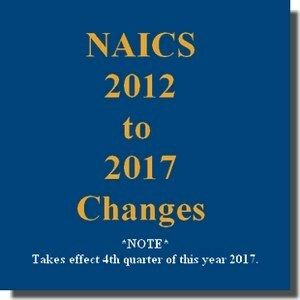 For Future Notices on NAICS Changes, Be Sure to Subscribe to Our List!